Making Sheridan a sustainable facility requires more than just adopting new methods and policies. Officials say it requires a whole new mindset inside the college. The eye-catching waste bins promoting ecological sustainability spread across Sheridan’s Trafalgar Campus have been around for more than two years now. 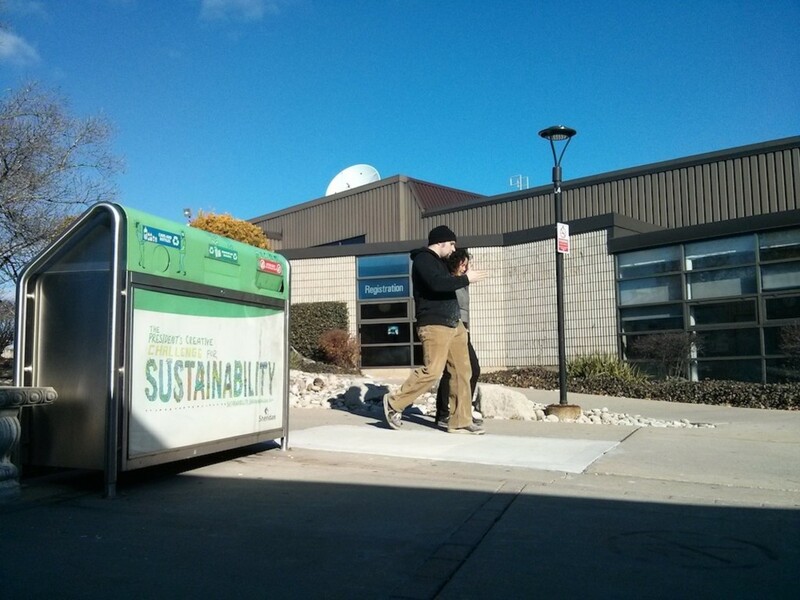 However, the changes in school infrastructure and student lifestyle that the bins promote is a slow and complicated undertaking being overseen by Sheridan’s Office for Sustainability. Amid the clutter of small offices on the B Wing’s second floor, a small team of people is aiming to address the issue of sustainability at Sheridan. They are working to prepare the school for an uncertain future in market pricing and energy consumption. While ecological sustainability has been defined in many ways, Sinnock paraphrases a commonly referenced 1987 United Nations Conference on the Human Environment and Development’s Brundtland Commission Report as his definition: “making sure present actions don’t impact or impede the next generation’s ability to make a living,” whether it be by social, economical or ecological means. “That definition is great, except it tells you very little about how you do that,” said Sinnock. Avoiding conditions that undermine people’s capacity to meet their basic needs. Avoiding human beings’ contribution to the progressive buildup of substances extracted from the Earth’s crust. Avoiding buildups of chemicals and compounds produced by society. Avoiding physical degradation of natural processes. In April Sheridan announced its sustainability initiative known as Mission Zero with the Natural Step’s scientific principles as its basis. Mission Zero consists of two major components. They are an Integrated Energy and Climate Master Plan (IECMP), which details the school’s strategy to reduce carbon and energy emissions by 50 per cent by 2030, and Zero Waste Sheridan, which aims to minimize and better manage food waste within the college. “Those two key pieces come with an engagement and outreach component to them and admittedly we’re not quite at the point where we’re fully staffed to do that engagement. It’s quite an undertaking,” said Sinnock. In the future, Sinnock believes students will “begin to see some real transformations in their learning environment” by way of infrastructure as well as being reflected in the school’s culture and values. Sheridan’s President Jeff Zabudsky, who helped launch the President’s Creative Challenge in 2011 which is promoted on the sustainability waste bins around campus, sees the potential of being a “model” institution and a “leader” in sustainability as “a way to brand ourselves” to encourage students to choose Sheridan. While the school has made advancements in areas such as waste sorting, and minimizing the negative effects of ice salt by adjusting the quantities used, “we still have a ways to go,” said Zabudsky. “As much as I like to buy all sustainable things, sometimes it’s more costly upfront, and you just can’t make the case” around a return on investment of a purchase which is the basis for the Board of Governors’ funding of sustainable initiatives. As part of the 2013-2014 operating budget, Sheridan’s board set aside $3.4 million in funding for the IECMP, aimed at developing and enhancing control systems for heating, lighting and water usage as well as improvements to the building envelope. According to Sinnock, currently the B Wing, C Wing, D Wing and E Wing are connected to a new “grid” that more effectively networks the school’s supply of heating, cooling and central equipment and does a much better job controlling the flow of resources between each building. Sinnock acknowledges that there are also “clusters [of the college that are] connected” throughout the campus, but those clusters and many wings remain on their own heating and power grids while not utilizing potential energy savings through window refitting and insulation improvements. Sheridan College is a member of the Association for the Advancement of Sustainability in Higher Education (AASHE), which is responsible for the Sustainability Tracking, Assessment & Rating System (STARS) program. Sheridan’s most recent submission to STARS was on July 12, 2012 and the institution received a bronze rating, with silver, gold and platinum being higher achievable rankings. Sheridan did not submit a report to AASHE in 2013. “Starting in January, we’ll be doing the next update of that, so it’ll be a few months for us to develop that. It’s quite a process,” said Sinnock. Though he is unable to give a definitive date, Sinnock said the Office for Sustainability plans to resubmit Sheridan’s progress reports to AASHE sometime in 2014 and to have results made public on AASHE’s website ideally by the middle of the year. In the meantime, the Office for Sustainability is working to implement upgrades to the school’s heating and power grid, continuing to improve the effectiveness of its waste management, and working on a metering system to measure their success. The Office for Sustainability is also hiring new staff by way of an administrative assistant that started in October, and is looking to hire a data assessment & reporting officer. Added by Sheridan Sun on November 21, 2013.